Borman on the job at Hudson Hall. The Chicago-born Borman has a precise way of speaking that is unusual for people who hail from that city, but which may account for his skill in an exacting line of work. His fifteen-year-old decorative painting firm, DesignRed, specializes in faux finishes that don’t ring false; and trompe l’oeil painting that truly trompes. Borman started out as a chemist—a field of study whose “logic appealed to me intellectually,” he says. The dayto-day work had less appeal, however, and in casting about for something more satisfying, he hit on painting. He has painted and drawn all his life, and one of his earliest memories, Borman says, is of “the fantastic smell of oil paint.” In the early 2000s, he started out painting apartments in Brooklyn, and gradually learned rigorous decorative techniques that ranged from water gilding to verre églomisé. 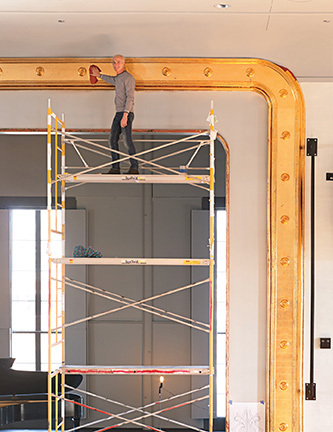 Borman recently donated his time to help with the refurbishment of the grand theater of the 1855 landmark Hudson Hall, doing the gilding and stenciling work on the proscenium arch. “I am thrilled and honored,” he says, “to have been a part of such an important project.” Nothing’s faux about that sentiment. Some examples of Greif’s work.